Research journals are filled with strategies to motivate students to increase student engagement and performance. It seems to me, an important prerequisite question isn’t asked enough. That is, how do you motivate teachers to be more effective? If teachers aren’t motivated to improve the performance of their students, the students are not likely to be motivated themselves. To motivate teachers it is important to understand more about motivation. Motivation is an inner desire to make an effort. It is seen as an arousal component that is initiated by a need or desire for to improve or finish a task or objective. Motivation focuses attention on particular issues, produces effort, results in persistence, and should lead to task strategies. Motivation is an individual characteristic and is difficult to generalize from one individual to another. It is dynamic and unfolds over time. It’s a process, not an event. Motivational processes lead to intentions that result in behavior. The topic of motivation is too broad to adequately cover in one post, so this is the first of a two part series on organizational psychology research regarding employee (teacher) motivation. In this post I will focus primarily on current discussions of improving teacher performance through methods known as reinforcement or incentives. Reinforcement is the motivation method of choice for most organizations, primarily because of its quick fix perception. Reinforcement is based on the idea that some behavioral consequences (rewards) increase the likelihood that a behavior will be exhibited again. The idea then is to reward behavior that leads to desired outcomes, and make sure undesirable behaviors are not rewarded. Many school districts are breaking from the tradition of rigid pay scales base on number of years experience and degree level attained to a hybrid pay system of reinforcement or incentive pay-for-performance models along with established pay scales. Large school districts, such as Washington D.C. have moved to this system of motivation through reinforcement in attempts to increase student performance. 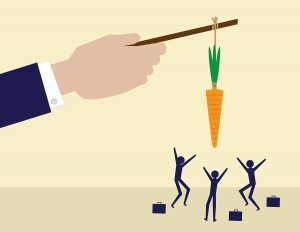 Incentive programs aren’t always effective in motivating teachers. In this post we’ll focus on where incentives are effective. Reinforcement programs are effective in improving attendance, increasing safety behaviors, and increasing procedure following behaviors. Research has found that incentives can be used to motivate employees in repetitive type behaviors. Study after study has found incentives can improve the quantity of behaviors, but financial incentives have not been found to increase the quality of behaviors. As school districts search for ways to improve teacher effectiveness, they must evaluate the tasks teachers execute and distinguish which are important simply in quantity and which behaviors must be performed with high quality. A job analysis can help identify behaviors and determine which behaviors should be incentivized and which behaviors need to be motivated through other means. It makes little sense to spend money on reinforcing behaviors that will not result in improved teacher and student effectiveness. Clearly this post is not a list of “10 Ways to Motivate Teachers.” We cannot pretend that methods that work for one school district or a few teachers will work for all teachers. 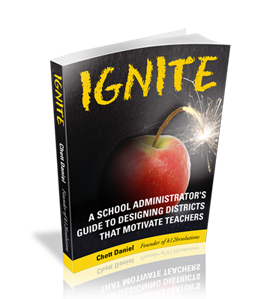 School administrators are astute leaders and once they understand the complex nature of motivation and reinforcement they can determine how to influence the behaviors of teachers that lead to desired outcomes.